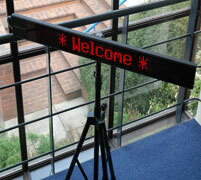 Designed and manufactured in the UK, LS Designs' versatile LED message display, i-show, is probably the markets easiest to operate product. Requiring only a standard PC keyboard (PS2) up to 99 messages can be quickly and simply programmed in a matter of minutes. 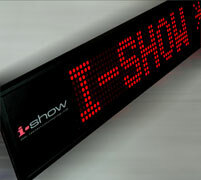 Hung on a wall, sat on a stand or on show in a window, the slender and attractive i-show is able to shout above the crowds in complete silence, sending out your instantly configurable selection of messages, captivating attention with a host of animation options. Submit your details via our contacts page!! !